Baton Rouge, LA – April 12, 2018 – Lamar Advertising Company (Nasdaq: LAMR), one of the largest out of home media companies in the world, is donating digital billboard space in support of “#360fortheplanet,” a PSA campaign spearheaded by 1% For The Planet that will encourage businesses and individuals to take greater responsibility for the planet. 1% For the Planet is a global organization comprised of businesses, nonprofits and individuals working together for a healthy planet. From Monday, April 16th to Sunday April 22nd, Lamar will display messages promoting environmental awareness across 40 digital billboards in 25 markets across the country. “We have always believed in the power of our network to drive awareness of important issues, and we are very proud to be part of this effort,” said Allie McAlpin, Communications Director of Lamar Advertising Company. 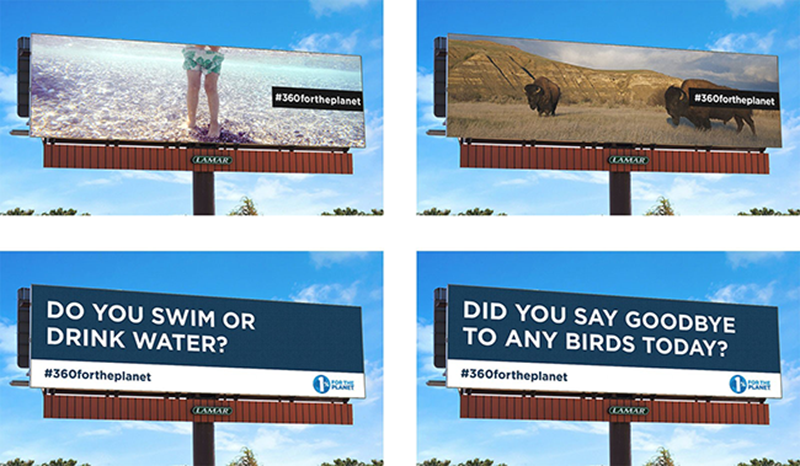 In addition to the billboard component to be delivered through Lamar, 1% For The Planet will also utilize social and digital channels as part of a multi-media campaign to drive traffic to its website and create meaningful engagement. Campaign creative will communicate the pressing environmental challenges that our planet currently faces, while encouraging the creation of user-generated content in which individuals can convey their personal passion for the planet. "The challenges facing our planet right now are urgent, but at the same time the opportunity for everyone to engage and make a difference is enormous," said Kate Williams, CEO of 1% for the Planet. "We are so grateful to Lamar for their partnership in raising awareness of this very worthwhile cause with a broad national audience. These billboards provide a unique touch point with millions of Americans to spread our important message this Earth Day." Founded in 1902, Lamar Advertising Company (Nasdaq: LAMR) is one of the largest outdoor advertising companies in the world, with more than 348,000 displays across the United States, Canada and Puerto Rico. Lamar offers advertisers a variety of billboard, interstate logo, transit and airport advertising formats, helping both local businesses and national brands reach broad audiences every day. In addition to its more traditional out-of-home inventory, Lamar is proud to offer its customers the largest network of digital billboards in the United States with over 2,900 displays. Please feel free to explore our website www.lamar.com or contact us at hello@lamar.com for additional information. 1% for the Planet is a global organization that connects dollars and doers to accelerate smart environmental giving. Through our business and individual membership, 1% for the Planet inspires people to support environmental organizations through annual membership and everyday actions. We advise on giving strategies, we certify donations, and we amplify the impact of the network. Started in 2002 by Yvon Chouinard, founder of Patagonia, and Craig Mathews, founder of Blue Ribbon Flies, our members have given more than $175 million to environmental nonprofits to date. Today, 1% for the Planet is a network of more than 1,400 member businesses, hundreds of individual members, and thousands of nonprofit partners in more than 60 countries. Our headquarters are located in Burlington, VT with staff located around the world. Lamar Advertising Company (Nasdaq: “LAMR”) will release its first quarter ended March 31, 2018 earnings report before the market opens Wednesday, May 2, 2018. Lamar will launch a new comprehensive airport advertising program, including a variety of high impact static and digital media formats.